Filled with resilient spun fiber. Extra padding with seamless construction under heel. Cover whisks away moisture to eliminate skin-damaging perspiration. 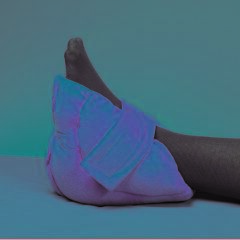 AllegroMedical.com presents The Ultra-Soft Heel Cushion. Filled with resilient spun fiber. Extra padding with seamless construction under heel. Covered with a soft launderable Cozy Cloth fabric. Cover whisks away moisture to eliminate skin-damaging perspiration. Reusable and launderable.